DUAL MOUNT: Use the CamKix Hot Shoe Mount Adapter Kit to attach your Phone or GoPro Hero to the flash mount of your DSLR Camera. Suitable for Gopro Hero 5 Black / Session, Hero 4 Black / Silver / Session and other action cameras or iPhone, Samsung and most other phones. RECORD / MONITOR / CONTROL: Record your photo shoot with your Phone or GoPro Hero camera. Or use an app on your Phone to measure the lighting, monitor your DSLR camera or even control your DSLR camera. You can also use your Phone to edit and post your DSLR pictures. WHAT’S INCLUDED: Hot Shoe Mount (with 1/4″ tripod thread), a GoPro mount (with 1/4″ tripod connection), a Large Thumbscrew, a GoPro mount adapter (with 1/4″ tripod thread), a Universal Phone Holder (with 1/4″ tripod connection) and a Cleaning Cloth. ROTATE / TILT: The Universal Phone Holder and the GoPro Mount can both be rotated and tilted to provide you the ideal position for recording, monitoring or controlling. The Phone Holder connects in landscape or portrait mode and can hold phones with a width between 2.24″ (5.7 cm) and 3.18″ (8.1 cm). TRIPOD CONNECTION: If you remove the Hot Shoe Mount, the GoPro Mount and the Universal Phone Holder can also be connected to a large or compact tripod. Use the CamKix Hot Shoe Mount Adapter Kit to attach your Phone or GoPro Hero to the flash mount of your DSLR Camera. Suitable for Gopro Hero 5 Black / Session, Hero 4 Black / Silver / Session and other action cameras or iPhone, Samsung and most other phones. Record your photo shoot with your Phone or GoPro Hero camera. Or use an app on your Phone to measure the lighting, monitor your DSLR camera or even control your DSLR camera. You can also use your Phone to edit and post your DSLR pictures. 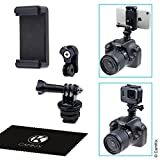 The Universal Phone Holder and the GoPro Mount can both be rotated and tilted to provide you the ideal position for recording, monitoring or controlling. The Phone Holder connects in landscape or portrait mode and can hold phones with a width between 2.24″ (5.7 cm) and 3.18″ (8.1 cm). If you remove the Hot Shoe Mount, the GoPro Mount and the Universal Phone Holder can also be connected to a large or compact tripod. CamKix If for any reason you are unhappy with any product by CamKix, please do not hesitate to contact us. We take full ownership and responsibility for the quality of our products and will do our very best to solve your problem quickly and efficiently! CamKix-USPTO# 86127507- is a registered trademark protected by US Trademark Law. CamKix products are sold by authorized sellers only. This entry was posted in Discount Photography and tagged Adapter, Apps, Attach, Camera, Camkix, Controlling, DSLR, Flash, GoPro, Hero, Lighting, Monitoring, Mount, Phone, Photo, Record, Shoe, Shoot by Ball Photo. Bookmark the permalink.